First make the medallions, joining them in a chain as long as desired. To make 1 medallion, chain 7, join in a ring. 1ST RND: 16 dc over ring. 2D RND: Make 16 picots, each picot consisting of 5 ch. Catch the end of ch of 5 in 1 dc of 1st round by 1 sc. Join last picot to on wrong side. This completes 1 medallion. In making 2d medallion, join 1 picot to 1 picot of 1st by chaining 2, 1 slip stitch through picot of 1st, and then chaining 2, in place of making an unbroken 5 ch. In joining all subsequent medallions, take care that the joined picots come opposite each other, with 7 between every 2 joins. When the chain of medallions is as long as required, finish the upper part of heading lengthwise, thus: Fasten thread and work from right to left, in every row. 1ST ROW: 1 sc over picot, 5 ch, 1 sc over next picot. Repeat until 6 picots have been made. Then ch 1, pass to the edge of next medallion and proceed as before. 2D ROW: Work on the 4 middle picots of the 6, skipping the 2 side ones. 1 sc over picot, 5 ch, 1 sc over next picot, etc., until 3 picots have been made. Then ch 3, and pass to 1st of 4 picots of next medallion, making 3 more picots, etc. 3D ROW: Of the 3 picots first made in 2d row, work 1 sc over the middle 1. * Ch 3, 1 dc over next picot (last of 3). Ch 3, 1 treble crochet in middle stitch of ch of 3. Ch 3, 1 tr c in same stitch. Ch 3, 1 dc over 1st picot of next group of 3. Ch 3, 1 sc over middle picot. Repeat from * to end. 4TH ROW: 1 dc in every stitch of 3d row. Turn the work and finish lower part of heading from opposite direction, fastening thread as before. 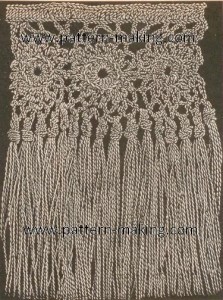 1ST ROW: Make 6 picots on every medallion, ch 1, make 6 picots on next medallion, etc. 2D ROW: Make 5 picots on every medallion, ch 3, pass to next medallion, etc. 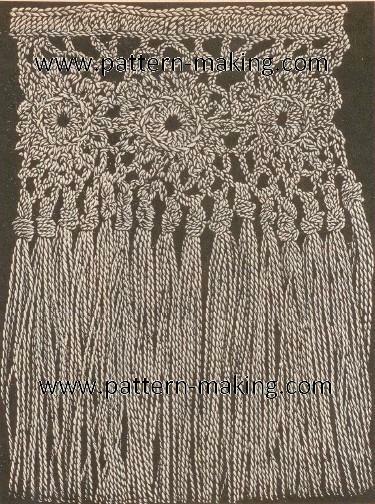 The fringe is to be knotted into these 5 picots on each medallion and into the chain of 3 between every 2 medallions. For 1 tassel, take 6 strands of silk 6 inches long (or longer if desired), pass the bunch through and double it. Tie one small knot with the 2 ends, and one larger knot with the whole bunch. Clip the ends of the tassels even.